Who knew? 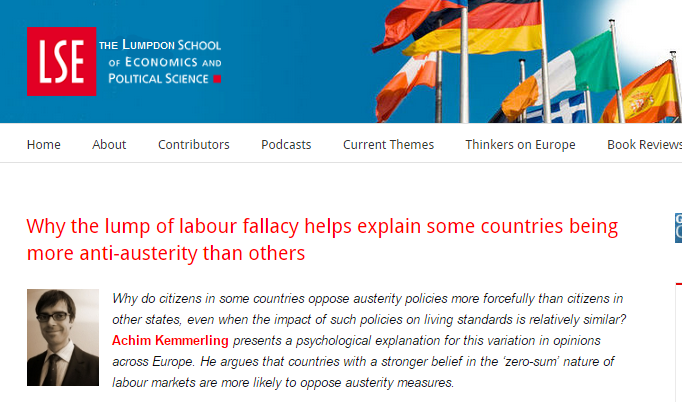 People oppose austerity -- because the lump of labour fallacy! Yes, a disclaimer is probably a good idea. Especially when you are publishing nonsense that has been thoroughly discredited. In short, the lump of labour is NOT an idea that some people have; it is an idea that some people ATTRIBUTE to other people. It is a projection. The fallacy is in the head of the beholder. I actually believed that for many years and actually repeated it often. It has occurred to me that when I was being taught that about six percent of the men in the United States between the age of 25 and 54 were not working. And that today 16 percent of the men in the United States between the age of 25 and 54 are not working, and it won't be very different even when the economy is at full employment by any definition. And so something very serious has happened with respect to the general availability of quality jobs in our society and we can debate whether it's due to technology or whether it is not due to technology. "Union Arguments for Shorter Hours"
In the summer of 1959, Loren Goldner and I hung out together at the City of Berkeley's Camp Cazadero. Loren called me "Stick" because I was skinny and because my last name was Walker. Walking stick &gt; Stick Walker. I'm not sure if that was the year the boys' camp did a talent show skit based on exclamatory action comic book sound-effects words. Pow! Bam! Gulp! Rat-a-tat-tat! Neeeiyow! Vrooom! The fear of unemployment runs through much of the trade unions' justification for shorter hours. In the last half of the nineteenth century, the make-work idea was expressed in its very crudest form. The concept prevailed that there was just a given 'lump of work." Shorter hours of work meant that more men had to be found to do the job. Increased demand for workers, labor contended, drove wages up. After World War I, the economic arguments made by unions became more refined, but the basic ingredients were the same. Unions argued that shortened hours coupled with higher wages and employment increased total spending; increased purchases led to more production, and this, in turn, created even more employment. Actually, the 'lump of work" argument and its more complicated variation described above fail to consider two important factors. First, changes in hours of work are frequently accompanied by changes in productivity. If per unit costs of production decrease with shortened hours and increased productivity, there is a possibility that lower prices will expand demand. The "lump of work" grows larger under these commonly occurring circumstances. Secondly, there are usually other economic factors at work which tangibly increase the "lump of work." Actually, the first factor reinforces the "more refined" economic arguments for shorter hours. To reiterate: shorter hours lead to increased productivity resulting in lower prices that expand demand thereby creating jobs. The second factor simply affirms that ceteris is not paribus and thus is irrelevant to the refined arguments. In short, Goldner confirmed that shorter hours may indeed create more jobs but not for the "crude" or "refined" reasons that the pamphlet attributes to union advocates of shorter hours. The logical/rhetorical gymnastics are dazzling. Who said there was just a given lump of work? Well, the unions didn't actually say it but it can be "inferred" from their advocacy of shorter hours. What were the "basic ingredients" that stayed the same between the crude and the refined arguments? That shorter hours created more employment. What "important factors" did both the nineteenth century argument and its more complicated post-World War I successor "fail to consider"? Well, um, that the jobs resulting from the productivity gains from shorter hours made the lump of work grow larger, therefore there wasn't a fixed lump of work. In other words, it's like those math exams in high school where you get marked wrong even though you got the right answer because your pencil work didn't conform to the way they did the proof in the textbook. Only in this case, it is as if the teacher ignores what you actually wrote and marks you on the basis of what he assumes you must have been thinking based on who your friends are and what desk you sit at in class. Economists forget, at their peril and ours, that "economic laws" are contingent on "The Law," in Anatole France's sense. When the rich find it convenient to house their servants under bridges, the majestic law that forbids both rich and poor to sleep there will go unenforced or be repealed. The "law of supply and demand" is no exception. Nor is "Say's" law of markets (which I would prefer to call the law that a cheap market will always be full of customers). The repeal in 1814 of the apprenticeship clauses of the Elizabethan Statute of Apprentices may appear to be of no more than antiquarian interest. From today's perspective, the ancient requirement of seven years servitude to qualify for particular trades would be indefensible. In this case, at least, laissez faire does indeed seem more reasonable than the letter of the old law. But there was a darker subtext to the agitation for repeal. Combinations of workers were illegal; petitioning for enforcement of the law gave tradesmen a legal loophole under which they could conduct a semblance of collective bargaining. The decisive argument in favor of repeal -- which according to T.K. Derry, "echoed through the debates" -- was the one Serjeant Arthur Onslow, M.P. outlined in a speech of April 27, 1814: ",,,the continuance of this law is highly prejudicial, and affording a color for the most dangerous combinations: nothing would so much tend to unnerve them, as repealing these restrictions." Viewed in isolation from its historical context and the complex of other legal restrictions, repeal of the apprenticeship clause seems to make "economic" sense. In context, though, it appears as a strategic manoeuvre to suppress a residual avenue for redress available to a politically disenfranchised group. There are no "economic laws" in isolation from their historical and legal contexts. The Black bill, Green and the Blue Eagle: "to bargain collectively through representatives of their own choosing"
The story is told by three of the key actors, Frances Perkins, Leon Keyserling and Rexford Tugwell, of how the Roosevelt administration, in its eagerness to "get rid" of the Black thirty-hour bill and to put something in its replacement to placate labor, incorporated the right to collective bargaining in section 7(a) of the National Industrial Recovery Act. "When we first came to Washington in 1933," Perkins wrote in her memoir, The Roosevelt I Knew, "the Black bill was already before the Congress. Introduced by Senator Hugo L. Black, it had received support from many parts of the country and from many representatives and senators." Meanwhile, according to Keyserling, the architects of the NRA "would not have included either Section 7(a) or the wage or hour or labor standard provisions. These emerged through a series of haphazard accidents reflecting the desire to get rid of the Black bill and to put something in to satisfy labor." "It will be remembered," confirmed Tugwell in his memoir, "that one of the reasons why NRA was sponsored by Roosevelt, and why the act was passed in the special session of spring, was the threat of a thirty-hour law being pushed by Senator Hugo Black." So I went, with his encouragement, to testify. It was a trying experience. Except for my appearance for the bill providing for the Civilian Conservation Corps, it was my first appearance as a cabinet member before a committee of Congress, and this was a full dress affair. Senator Black apparently wanted it that way. 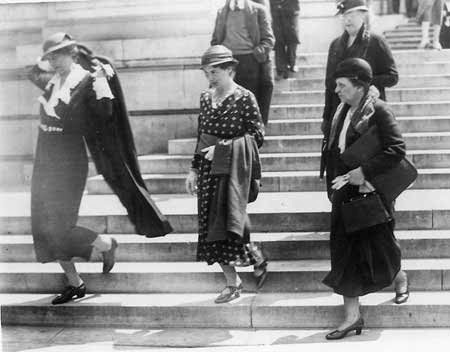 Furthermore the attendance of Miss MacDonald and Mrs. Roosevelt made it a matter of considerable publicity. One could not avoid the ballyhoo of the photographers, the press, the radio, the klieg lights... .
At any rate, Roosevelt was fully committed. From that time on, Congress, the newspapers, the people, knew he was in favor of doing something by law to mitigate the hardships of unemployment by techniques of control of hours, wages, and working conditions. He was committed to the principle but not to this particular program. The Black bill did not go through. Instead, the National Industrial Recovery Act was evolved and adapted. Some biographers of Roosevelt have gone so far as to say that Roosevelt betrayed the Black bill in favor of the National Industrial Recovery Act. They regard this as disloyalty to principle. They say that the Senate committee was about to add a paragraph to the bill which would have set up a minimum wage principle. But those of us who were close to the situation could not detect, at any time, that the adoption of a minimum wage clause was in the making. And, as events showed, the Supreme Court in those days would surely have found the Black bill unconstitutional. He did not approve the increase in maximum hours, but accepted it on the ground that it represented the viewpoint of the Labor Department and the Administration. Minimum wages, however, were opposed, except insofar as they applied to women and children. The federation traditionally rejected legal minimum wages, since they tended to become maximum wages and thereby lowered the rates of high-paid workers. The tripartite boards would not act in the interest of labor where collective bargaining did not exist. He urged, therefore, that the bill be amended to guarantee workers "the free exercise of the right to belong to a bona fide labor organization and to collectively bargain for their wages through their own chosen representatives." The wording of that amendment was not completely original. During World War I, the National War Labor Board had stipulated that "The right of workers to organize in trade unions and to bargain collectively through chosen representatives is recognized and affirmed." In 1919, President Woodrow Wilson convened a "First Industrial Congress," with representatives from business, labor and "the general public" (more businessmen), at which the labor group proposed a resolution, vigorously opposed by business, that affirmed, "The right of wage earners to be represented by representatives of their own choosing in negotiations and adjustments with employers in respect to wages, hours of labor, and relations and conditions of employment." At the earliest opportunity I reported to the President that two fairly complete plans were being mapped out — one by Wagner and Jacobstein, the other by Tugwell and Johnson. They both rested on the idea of suspending the effect of the anti-trust laws in return for voluntary agreement by industries for fair competition, minimum wage levels, and maximum hours. I told him that the plans were not very different and both apparently had gotten around constitutional difficulties. The President asked Henry Wallace and me to get the two groups together. That was arranged, and the conferees met daily. When they had completed their draft bill, the President showed it to me. It was novel. It seemed generally satisfactory, but it had some weaknesses. "This is very drastic," I said. "The hours of labor and wages are involved, and I think I ought to get the president of the American Federation of Labor to go over it." I called in William Green. He liked some of it but said that no provision was made for collective bargaining. He thought the bill could be used as a method for putting the labor unions out of business. General Johnson took the bill and redrafted it, incorporating Section 7(a), which was meant to assure labor's right to collective bargaining. Written in general terms 7(a) was a problem in semantics. It was a set of words to suit labor leaders, William Green in particular. When they discovered later what could be done under 7(a), they called it "labor's Magna Charta." 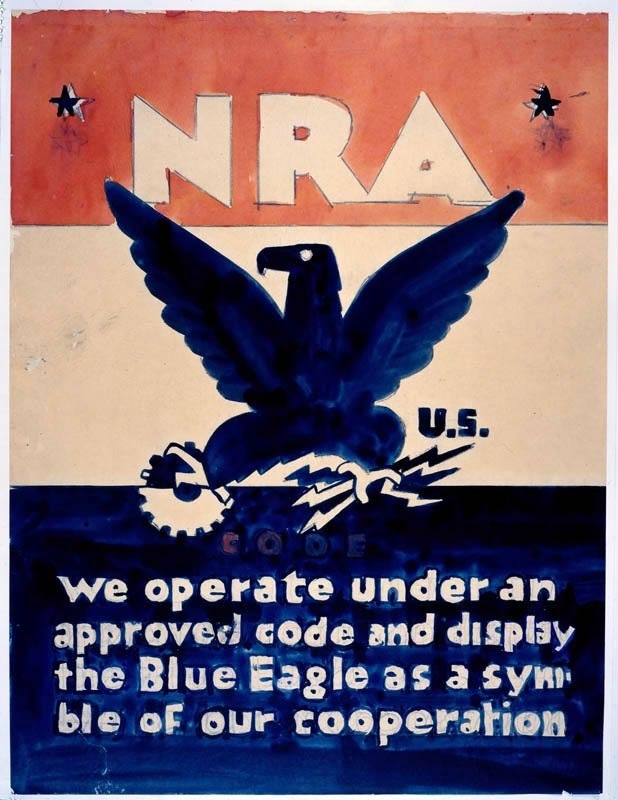 Charles Coiner's original design for the "Blue Eagle"
Employes shall have the right to organize and bargain collectively through representatives of their own choosing, and shall be free from the interference, restraint or coercion of employers of labor, or their agents, in the designation of such representatives or in self-organization or in other activities for the purpose of collective bargaining or other mutual aid or protection. Employees shall have the right to self-organization, to form, join, or assist labor organizations, to bargain collectively through representatives of their own choosing, and to engage in other concerted activities for the purpose of collective bargaining or other mutual aid or protection, and shall also have the right to refrain from any or all of such activities except to the extent that such right may be affected by an agreement requiring membership in a labor organization as a condition of employment as authorized in section 158 (a)(3)of this title. Now pay attention to what happened here. Labor bargained for the right to bargain collectively. The A.F. of L. had something -- "support from many parts of the country and from many representatives and senators" for the Black bill -- that William Green exchanged for the inclusion of section 7(a) in the NIRA. Labor owns the right to bargain collectively. They (we) bought it. Nobody gave it to them. Anyone who tries to take that right away is a thief. Got it? Dietrich Vollrath wasn't wrong about the Luddites losing their jobs, he was just wrong about them having any opinion whatsoever about "the economy losing jobs in aggregate." Not only did the Luddites have absolutely nothing to say about such statistical aggregates and macroeconomic concepts, they were equally reticent on matters of quantum physics, Freudian psychoanalysis and the theory of anthropogenic climate change. In short, not only did the Luddites not travel back in time to torch John Kay's house in 1753, they also failed to express any views on concepts that didn't appear even in rarefied scholarly discourse until the next century. So why does a laughably anachronistic fable about an alleged Luddite error have such enduring appeal to economists in the twenty-first century? I've been asking that question for twenty years now. I'm pretty sure the answer is important. I doubt that an explanation will have any effect on endless repetition of the fable. Economist want to believe in the fable. Their paychecks depend on it. Though the character of the attacks differed from region to region, most historians see enough similarities in the tactics and aims of these groups to categorize them under the same rubric. Most importantly, all scholars agree that the Luddites were not anti-technology. This is, of course, counter to the current popular perception of their actions; the term Luddite is used nowadays to denote someone who stubbornly refuses to use new methods and ideas, such as computers. The Luddites were not against machines per se, but against the threat to their livelihoods that some machines posed. Maybe "all scholars agree" is a bit strong. But you get the drift. This is not to suggest that the Luddites were followers of Cartwright, although government officials subsequently imagined or exaggerated links between radicals and rioters. The latter suspicions were the subject of a 1948 article, "Luddism, Hampden Clubs, and Trade Unions in Leicestershire, 1816-17." According to its author, Patterson, several apprehended members of a Luddite gang "tried unavailingly to save their necks by fabricating tales of the complicity of Major Cartwright, Sir Francis Burdett and Gravener Henson (the leader of the Nottinghamshire hosiery workers) in insurrectionary plots." Who then was this "commonalty" whose legislative rights were vindicated by Cartwright's pamphlet? Cartwright's radical doctrine ("taken from the plain law of nature, from Scripture and the obvious dictates of common sense...") was that "every individual of the commonalty hath a common and equal right with his fellow-citizens to vote in all elections for the House of Commons." Horrors! Americans who remember their high school civics may detect a family resemblance between Cartwright's argument and the slogan of the anti-Stamp Act rioters of 1765, "No taxation without representation." In his pamphlet, Cartwright directly cites "taxation without representation" and equates it with tyranny. From the perspective of tradesmen, non-enforcement and repeal of long-standing protective legislation would have same the effect, financially, as taxation. One of the core grievances of the Nottingham stocking-frame weavers was suspension and ultimately repeal of the Elizabethan law requiring seven years apprenticeship to qualify for the trade. Simply that though each individual has a natural right to inherit the earth as a co-partner in the universal inheritance, no individual has, or can have, a right to absolute ownership over particular spots of earth! That is Commonality in Land—public, general, national property, for ever! What distinguishes commonality from commonalty may be more nuance and perspective than substance. Faithful representation of the common people might well legislate common property in land. Capitalist "democracy" thus must always be hedged against the possibility of popular rule. The Luddite fable is a crucial part of that hedge, separating the abstract notion of 'legitimate' political democracy from the allegedly economically fallacious, and thus 'illegitimate,' striving for industrial democracy. Economists aren't just wrong when they invoke the hoary Luddite fable (or its ubiquitous lump-of-labor offshoot). They are disingenuous and deluded. They imagine themselves pontificating profoundly about efficiency and productivity when all they are doing is reciting a rote apology for privilege. Take your choice: representation and respect or imposition and contempt.